Hooks and Needles: Christmas - Reading and winding down. Christmas - Reading and winding down. Hello, Happy Christmas to you all. All good social clubs are ending with a party or film it seems this time of year. Christmas is unfolding slowly here, the Knit and Natter had their party yesterday. Last week the WI craft group had their last meet up for 2017, working on your own project we took a plate of food to share. The youth group took to the cinema to see Ferdinand, a 'fun' family film with David Tennant as the Scottish bull Angos. Last Saturday I took the teens and their friend to see the Star Wars film - The Last Jedi. I've heard mixed reviews but personally I loved it, the cinema was packed and I'm glad I'd booked tickets. At the end of intense scenes, I was a bit surprised to see other people in the room with me. It's not often I feel completely engrossed in a film. Apart from socials, after finishing my blanket, I've been crocheting a few angels as Christmas gifts. Like everyone else, there's been Christmas shopping, card sending and present wrapping to do. I start each year with good intentions of brilliant organisation of all things Christmassy but by December 1st it's the usual panic stations! I'd planned some Christmas reading but so far haven't read any. 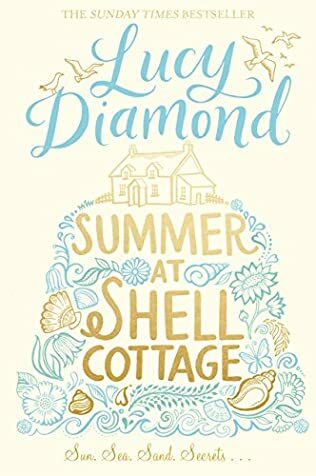 Instead I've just finished listening to Summer at Shell Cottage by Lucy Diamond on audible books, appalling language but... very enjoyable, I would definitely recommend it. It was lovely having a summer story to listen to during the cold UK weather. We've put Christmas cards in their display rack, there are so many ways people display their cards nowadays. Hung up the advent calendar I cross stitched many years ago. It was stitched on - bookmark Aida and then sewn onto a felt backing, there was supposed to have been a cross stitched picture on the top section. The teens have been so used to it looking blank now, bless them. I usually fill the pockets with wrapped chocolate coins each year. Put out the old rather battered Santa's post box made from a shoe box and covered in tissue paper. Put out the musical Christmas tree in the dining room. It was a gift from my friend a few years ago, originally with biscuits in it. Hung up some knitted Christmas stockings, the one at the bottom has been crocheted. They were meant to be filled with stuffing as tree ornaments. I used to knit these for Reception children in the local primary school and fill them with a chocolate lolly and coins. Displayed a wooden tree bought from Lidl, counting down the last 15 days to Christmas. QT under the tree, not interested in anything Christmassy, just wanting to look at the birds. Tomorrow I need to catch up with laundry and dusting, more wrapping and relaxing. Definitely relaxing. I need to make more sausage rolls and mince pies, no cake has been baked yet. No Christmas pudding either, as nobody ever wants to eat it. I'm hoping to crochet one more angel, just for me. Whatever you're doing this weekend, have a good one and thanks for stopping by. These last couple of days before Christmas day always have me a little frantic even on the years I've been organised. I love getting out the old familiar ornaments and decorations and remembering Christmases past. I was a little late starting my Christmas preparations this year with my mum being in hospital but I've managed to catch up. Daniel and his girlfriend arrived home last night and all I've got left to do now is the food shopping, that'll get done today and then I'm finished. It's enjoyable to go to those pre-Christmas group gatherings. I'm glad that you had a lovely time. I bet those reception class children loved the knitted Christmas stockings. Those were the days! It's nice to look back and now put out your decorations made or bought through the years. Wishing you and your family a happy Christmas. Your decor looks wonderful, hope you manage to relax and put your feet up. Have a wonderful Christmas. Your decorations are stunning! Have a lovely Christmas. Looks like you are ready for the big day. Merry Christmas! I love your cross stitch and QT! Merry Christmas!